I was wondering if anybody knew how to get video recorded with my 360 as a movie file. All that shows up on the sd card is the .SON format, is there any way to get just the pictures or a movie. Thanks for your help! You can play back the 360 recording with HumViewer but it will look like alternating Side Imaging. You cannot play back a 360 recording on the unit. This is a screen shot from HumViewer with a 360 recording. You can also play back the 360 recording with DeepViewFV after converting the file to that format. It will still look like the HumViewer version though. Thanks a ton Wayne, apologies for not seeing the other thread! Will try and post back with results/problems! 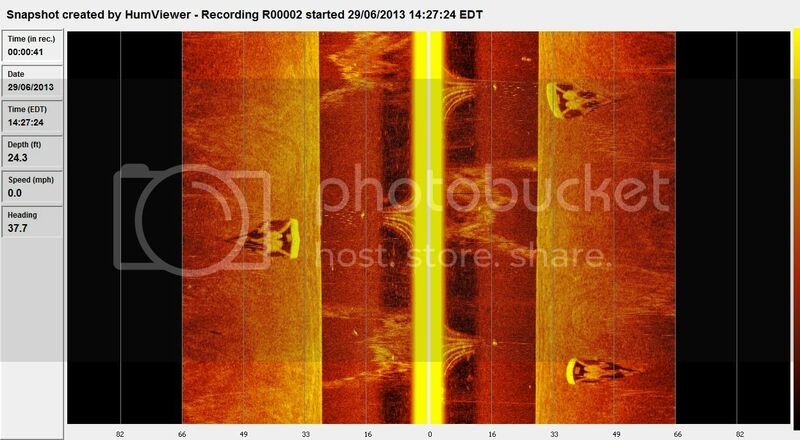 I was wondering if anyone could send me the .DAT and .SON files from a saved Humminbird 360 recording? I have been working on some Python scripts for mosaicing Humminbird sidescan images (see http://www.oceanecology.ca/sidescan%20sonar.htm), and I'm wondering if these scripts will convert the Humminbird 360 back into a circular display. I am also interested in purchasing a Humminbird 360 unit for our new boat as a replacement for an old forward-scanning unit that we have depended on for many years, so I'm very interested in the technology and its applications.